Character LCD Displays (aka Alphanumeric) are one of the most common display technologies available and for that reason we hold inventory for samples and prototypes in our Chandler, Arizona location. If you require assistance or need to order an LCD now, just call us (480-503-4295) or contact us. These displays have been in use for many years, and in some ways the technology has become a commodity, but it is important to select the best options to fit your design. There are many details concerning this technology, including: fluid type, operating voltage, controller/drivers and other key details that can make your design excel or under-perform. Our team of LCD specialists can assist you in selecting the best options so that your design is able to meet your needs and at a cost that is within your budget. Call today with any questions. A character is any letter (capital or non-capital), any number or punctuation mark (including a period, comma, back slash, etc.). These displays are used in applications such as change machines, measurement devices, and data loggers. The module has the ability to display letters, numbers and punctuation marks. One reason for the popularity of Character LCD displays is that they are equipped with a controller/driver chip containing a built in character (or font) table. The table holds preloaded letters, numbers, and punctuation for each language. The font table allows the designer to request any character by addressing (selecting) the number of that character. In other words, the letter capital ‘T’ may be assigned the number 31 and the “&” symbol could be assigned number 141. This eliminates the work required to create each charter from scratch and reduces the amount of time necessary to program the LCD module. Our standard character displays incorporate an English font, but other languages are available upon request. Negative mode and Positive mode. Monochrome displays can be built as Negative or Positive mode depending on the appearance you want to achieve. The LCD you choose for your new design sets the perceived value of your product. Think about it: The first thing your customer looks at when they are deciding whether to purchase your product, is the LCD display. If it looks good, then your product looks good. Here are a few details to consider when choosing the mode for your monochrome character LCD. Negative mode Vs. Positive mode. Negative mode displays are popular for new designs since they stand out. Negative mode means the background is a darker color, like black or blue and the characters/icons/segments are a lighter color such as: White, Red or Green. The opposite of a negative mode is positive mode where the background is a lighter color such as yellow/green or grey and the characters/icons/segments are a darker color like black or dark blue. Negative mode displays must have a backlight on all the time to be readable. The challenge is that the LED backlight will draw/drain 10 times more power than the LCD without a backlight. So, if this is a battery application, it is best to stick with a positive mode. Positive mode displays are readable without a backlight if there is enough ambient light. The LCD without a backlight will draw around 1uA. LED backlights can draw as little as 15mA up to 75mA or more depending on the number and brightness of the LEDs. The LED backlight on a positive mode display can be turned on for it to be readable in the dark. Positive mode displays are excellent for sun light readable. A negative mode LCD is the same cost as a positive mode containing a built in LED backlight. There is no difference in lead time between Positive or Negative. We carry both versions in stock and in many cases can ship the same day. There are several options available when ordering your character LCD. Below is an overview of choices available that do not require a tooling fee. The first question to answer is ‘what size of LCD?’ The larger the display the more information that can be displayed and the larger the characters can be. We recommend you choose one of the standard sizes on this page to reduce cost and lead time. Focus Display Solutions (aka FocusLCDs) carries many of the industry standard sizes in inventory and may be able to ship the same day. If you do require a unique sized display, contact us concerning a custom LCD option. Character LCD Displays are built in standard configurations such as 8×1, 20×2 and 40×4. The two numbers identify the number of characters in each row and then the number of rows. An example of this is a 20×2 which means there are 20 characters in each row and there are two rows. This will provide you a total of 40 characters. The more characters there are on the display, the more drivers are required to drive the LCD. The controller and drivers are included with the LCD. Note: It is possible to program the software to scroll your letters and numbers across the screen, allowing you to choose a smaller sized LCD and still display all your information. The cost of character displays is driven more by the size of the glass, then by the number of characters. A larger 8×1 can be more expensive than a small 16×2. Listed below are the most common standard character configurations. It is possible to custom build a unique combination such as a 12×2 or a 16×8. This would be considered a custom LCD and would require a one-time tooling cost and possibly a higher MOQ. Go to our Custom LCD page for information. Character LCD modules are available in two temperature ranges, Normal (for indoor use) and Extended (for outdoor use). The outdoor version will continue to operate down to -30C. The cost difference between normal and wide (extended) temperature range is 5% to 7% higher for the extended versions. In most cases, if cost is not critical, we recommend that you incorporate the wider temperature version. If the display is required to operate at temperatures below that, we can add a heater that will allow operation down to -50C. Note: the addition of a heater will require additional power and in some cases a one-time tooling fee. There are three types of backlights available for a character LCD module: No backlight; LED; or EL backlight. Before introducing the various backlight options, it is helpful to cover two terms that are common for backlights: NITs and half-life. Backlight Nits – A NIT is the measure of the backlights brightness. One NIT is roughly equivalent to the amount of light produced by one candle. Backlight Half-life - The half-life of a backlight is the amount of time, in hours, that the backlight will burn before it is half as bright as when it was first turned on. So if its rated half-life is 50K hours, then the backlight will be half as bright at 50K hours as when it was first turned on. The same backlight will be 25% as bright at 100K hours as when it was first turned on. Half-life may not be critical for your application if your backlight is on for limited amounts of time. Engineers designing a battery powered product may request a character module with no backlight since the backlight draws more than ten times (10x) the power required for the LCD alone. The goal with a battery powered product is to conserve power and extend the life-time of the battery. If the product needs to be readable in the dark or low light conditions, then it will be necessary to attach a backlight of one type or another. The best way to conserve power is to keep the amount of time the backlight is on to a minimum. Turn off the backlight as soon as the user no longer needs it. This is a common practice in cell phones. The backlight turns off a few seconds after the number is dialed or the phone is answered. The person using the phone will continue to talk, but the display will be dark. Half-life of LEDs - The half-life of a LED backlight can range from 50K hours to 90K hours depending on the amount of driving current, compared to the half-life of an EL backlight which averages 3K hours. DC Current – LEDs are driven by DC (Direct Current), which is the same type of power required for the character LCD logic voltage. Also, batteries supply DC which makes it easy to integrate the LED backlight with a battery. EL backlights require an AC (Alternating Current) to operate. The AC signal needs to be generated by an inverter. The added inverter increases the cost of the display and produces electrical noise that can interfere with neighboring circuits. Dimmable – LED backlights are easily dimmable; the user can adjust the brightness by reducing the driving current supplied to the LED. The ability to dim the backlight allows the user of your product to select different brightness levels. An example would of this might be a higher brightness while plugged into an outlet, and a dimmer brightness if battery driven. This is a common practice for cell phones. The backlight will be at full brightness for the first few seconds and then dimmed for the next few seconds. Note: Cell phones use OLED or TFT displays and not character technology. Character LCDs that include an EL (ElectroLuminescent) backlight are not as common and their popularity is decreasing. EL backlights are AC driven which requires an inverter to be supplied by the customer or attached to the LCD. Their half-life is rated at 3K hours which makes this a poor choice for products where the backlight will be on all the time. Their MOQ (Minimum Order Quantities) have increased in the last few years. At this time there is a 500 piece MOQ. There are some key advantages to EL backlights. They are very thin, around one to two millimeters in thickness. And they provide a very even flow of light. We carry inventory on a few EL character displays, but the majority of the character displays we sell are LED. 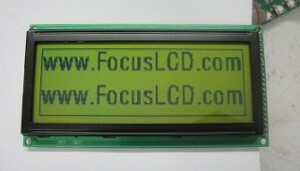 Focus Display Solutions sells standard and non-standard LCDs with an EL backlight. Call today to speak to one of our LCD specialist. There are several possible combinations of background colors. The most common color options are yellow/green; green/grey; blue/white; black/white; and RGB (Red/Green/Blue). Character LCD Displays are available in multiple different nematic fluid types, but the three most common are: TN; STN; and FSTN. A character LCD is constructed by placing the nematic fluid between two layers of ITO (Indium tin oxide) glass. The function of the fluid is to either block or allow light to pass through. A TN (Twisted Nematic) monochrome LCDs is the lowest cost option. TN does not provide a very sharp contrast and has a smaller viewing angle then STN or FSTN. A smaller viewing angle means the display is readable if you look directly at it, but if you rotate it more than 40 degrees in either direction, the characters will be difficult to read. An advantage of TN is faster response time than STN and FSTN and its ability to operate at lower temperatures. We recommend this fluid for applications that will operate at extremely low temperatures. TN is the lowest cost option of the three and is used primarily on segment types of displays in applications such as gas pumps and pagers. Below is a photo of a 20×4 character LCD with TN fluid. STN (Super Twisted Nematic) fluid is the most popular option. It provides a sharper contrast and a wider viewing angle than TN. Below is a photo of a STN 16 x2 character display. The cost difference between TN to STN ranges from 5% to 10%. The cost difference between STN to FSTN ranges from 7% to 12%. If you are unsure which fluid is best for your product, contact one of our technical LCD specialists to request details for your application. There are three types of polarizers: Reflective; Transflective; and Transmissive. The correct polarizer is determined by the various lighting conditions your character LCD display will operate in. Why does a LCD Display require a polarizer? The reflective polarizer is basically a mirror. It will reflect 100% of the ambient light and is ideal for displays operating in direct sunlight or in situations with very bright indoor lights. A reflective polarizer cannot be used with a LED backlight or EL backlight since it will not allow any of the light to pass through, but it is possible to use with a LED edge-lit or side-lit display. An advantage of an edge-lit display is that it is thinner than a LED backlight, but not as thin as a display equipped with an EL backlight. A Transflective polarizer is the most popular of the three options and works best with a display that requires the backlight to be on some of the time and off some of the time. It does not perform as well in direct sunlight as a reflective polarizer, but is sufficient in most cases. If you are not sure which environment your display will operate in, choose Transflective. The Transmissive polarizer is used when the backlight is on all the time. This is not the best option for battery powered products, but provides a brighter backlight. This polarizer must be used for displays that run in negative mode. Negative mode is when the characters are light colored and the background is a dark. Transmissive will provided the brightest backlight possible. If the same backlight is used on both a Transflective and a Transmissive. The brightness of the backlight on the Transmissive will be noticeably brighter. For more detailed information on polarizers, check out: LCD polarizers: reflective; transflective; transmissive or call us. Focus Display Solutions works with many OEMs and design houses to design in character LCDs for new projects. Focus Display Solutions stocks sample and production inventory in our Chandler, AZ warehouse or through distribution. This page contains a partial list of our standard displays. Simply choose the number of characters, the size of the display and the color combination that will meet your needs. If you need a size not listed on this page, please call us. We can still supply it to you. Our lead time on standard Character LCD displays – that are not in stock – range from five to seven weeks. This rapid lead time is due to the fact that we do not ship LCD’s via boat, but FedEx Air. By shipping via FedEx Air, we receive the LCD glass within four to five days after it is completed, compared to shipping by boat which can add several additional weeks to your lead time. Questions? Feel free to contact our US based technical support team about character, or any other LCD technology. Don’t see the exact display you want on this page? Focus Display Solutions can supply you a display to match the exact configuration you want, even if it is not in our current inventory. Available options include: background color, backlight type, operating temperature range, driving voltage and other possible choices. These are modifications that do not require a tooling fee. Focus Display Solutions is able to design and supply a custom character LCD solution to meet your requirements. The cost to design and tool up a custom replacement LCD is much less than the cost associated with retooling a case or having to redesign the customer’s PCB to accept a different LCD. The customer may also need the exact display to repair units that are in the field. Here is a case study on a custom 40×2 display that was redesigned to match the customer’s current product. Case Study. This custom character design allows the customer to avoid any redesign cost or delays in the manufacturing of their product and to offer replacement displays for products that had been in the field for over ten years. We receive many requests for LCDs to replace those manufactured by other LCD suppliers. Character LCD displays are built in standard sizes and configurations. This makes the process of locating an equivalent LCD a simple process, but it is critical to make sure that the replacement display is a drop -in equivalent to your current display. It may not be possible to build a 100% equivalent product without some modifications. Some LCD suppliers such as Seiko, Standish and Ocular (who no longer supply LCDs) had developed character LCDs that were unique. That is,they were not a standard off-the-shelf displays. We are able to match and replace these discontinued Liquid Crystal Displays. There may be a one-time NRE (Non-Recurring Engineering) fee required to modify the ITO glass, PCB (Printed Circuit Board) and bezel to match the dimensions and characteristics necessary for your production. If your current LCD supplier has discontinued your display, Focus Display Solutions (aka Focus LCDs) has the ability to cross it over to an equivalent display and in many cases Fed Ex/UPS a sample to you the same day. Call one of our US-based Technical Support people at 480-503-4295 or email us by using the Contact form. We respond to all business inquiries within one business day and in many cases can offer you a quote the same day. 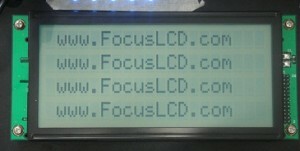 Note: when you begin ordering LCD displays from Focus, we will supply you with the data sheet. If you purchase the display, you should own the data sheet. Providing us the full part number of the LCD allows us to determine not only the size of the display, but also the type of construction such as COB (Chip on Board) or COG (Chip on Glass), number of characters, backlight option, operating temperature range, background and backlight colors, viewing angle, backlight and LCD logic voltage, and in most cases the controller driver used. With the part number, we will attempt to locate a full data sheet with enough details allowing us to quote a replacement for your discontinued display. If we cannot locate a data sheet, we will ask if your previous supplier had provided one to you. If we are unable to locate the data sheet of your current LCD, we will request a data sheet. If possible, please forward over the data sheet or a link to the data sheet. If your LCD supplier is no longer in business or they will not provide you the data sheet, the next option is a photo of the display. If you are unable to locate the data sheet and we cannot gather enough information from the LCD part number, we can estimate a cost from a photo. We require two photos to estimate a quote. The LCD next to a ruler or tape measure. This allows us to determine the dimensions of the LCD. A photo of the LCD when it is on, this can be a photo from your web page. This photo is necessary to determine if there is a backlight and the background color. Send the photos to our contact us page. If you decided to move forward with us and order samples of your replacement display based on the estimated cost, we will require two of your discontinued samples. They do not need to be working displays, but need to be in good condition. Please note: We will not be able to return the two displays. Do you have any questions? Call now for support and lead time on samples.